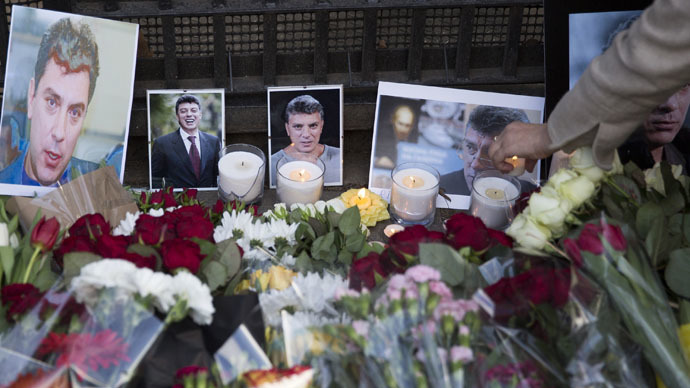 Russian President Vladimir Putin described the assassination of Boris Nemtsov as “brazen.” He also asked the Interior Ministry to spare Russia from such shame and tragedies. The president said he wanted police efficiency ultimately enhanced, especially when it comes to investigating crimes of a political nature. Investigators looking into Boris Nemtsov’s assassination are considering a number of suspects, according to the head of Russia’s Federal Security Service (FSB), Aleksandr Bortnikov. “We always have [suspects],” Bortnikov told journalists at a briefing on Wednesday. A Ford vehicle the investigators have been looking for in connection with Nemtsov’s murder, appears to belong to a security firm that provides services for the Russian Finance Ministry among other organizations. “The Ford in question does not belong to the Finance Ministry,” the government agency’s press service told RIA. It also added that when the car passed the crime scene, police were already working there. Boris Nemtsov, 55, who occupied senior government posts under President Boris Yeltsin and afterwards became an opposition leader, was shot dead late on Friday night in the center of Moscow. Tens of thousands across Russia rallied in commemoration of the murdered politician on Sunday. On Tuesday, people stood in a kilometer-long line to get into Nemtsov’s memorial service hours before his funeral at the Troekurovskoe cemetery in Moscow. Some prominent Russian and foreign politicians and activists bid their final farewell to the slain opposition leader. The politician’s murder could have been provocation to destabilize the political situation in Russia, according to the Russian Investigative Committee. They are also looking into four other possible reasons behind Nemtsov’s killing. It could have been linked to the threats the politician received over his stance on the Charlie Hebdo shootings in Paris, or the current civil war in eastern Ukraine. The politician’s business activities and a possible assault related to his personal life are also being investigated.